1. Please check carefully before installing the cutting wheel to confirm whether the cutting wheel has deformation, cracks, and collapse. 2. When the flange is too small or the precision is poor, the cutting and grinding wheels is easily damaged. Please use it after improvement. 3. When the cutting and grinding wheels is marked with the direction of rotation, it must be in the same direction as the machine. On the contrary, the cutting is not sharp and it is difficult to perform the performance of the cutting wheel. 4. If a cutting wheel that does not match the workpiece being cut is used, it is prone to abnormal wear, poor sharpness, abnormal heat, and the like. 5. If abnormalities are found during the cutting process, stop immediately. .
6. 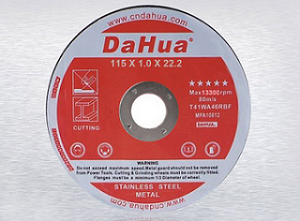 When the cutting is not sharp, the grinding wheel should be trimmed. If it continues to be used, it will cause overheating and overloading and damage the grinding wheel. 7. In the rotation of the grinding wheel, it is strictly forbidden to cut by hand, and the grinding wheel cannot be touched by hand or body. 8. Cutting and grinding wheels are strictly prohibited for operations other than grooving or cutting, to avoid abnormalities due to uneven force.